In today’s post I won’t be sharing a recipe but more of a technique on how to cut a pineapple. I remember that when I was a kid it was a huge mystery how people peeled such a large fruit and then cut it into pieces to serve it. And the truth is, it’s something really, really easy to do. When I go to the grocery store I always buy one or two pineapples. Like you already know, I don’t really like eating fruit, but I really enjoy it if it comes in a salpicón (fruit cocktail), a fruit salad and I almost always use it to make my green smoothie which is part of my breakfast every morning. To pick a really good pineapple I always pay attention to the way it looks. I make sure it has good color, that the leaves are not too old and withered, that the bottom is not too damaged and that it has a good pineapple scent. I always smell the bottom which is what starts to ripen first. If it smells a lot like pineapple and it’s really yellow, then it’s ready for you to eat. If I can’t smell anything and it still a bit green, then I take it home and let it ripen for a few days before cutting into it. It’s that simple. 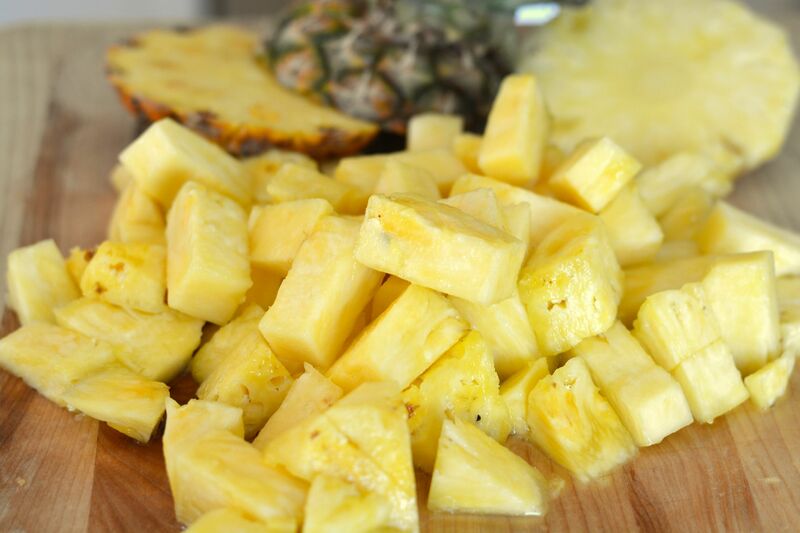 Place the pineapple on a cutting board and cut off the top and bottom parts with a knife. About ¼-½ inch (0.64-1.27 cm). 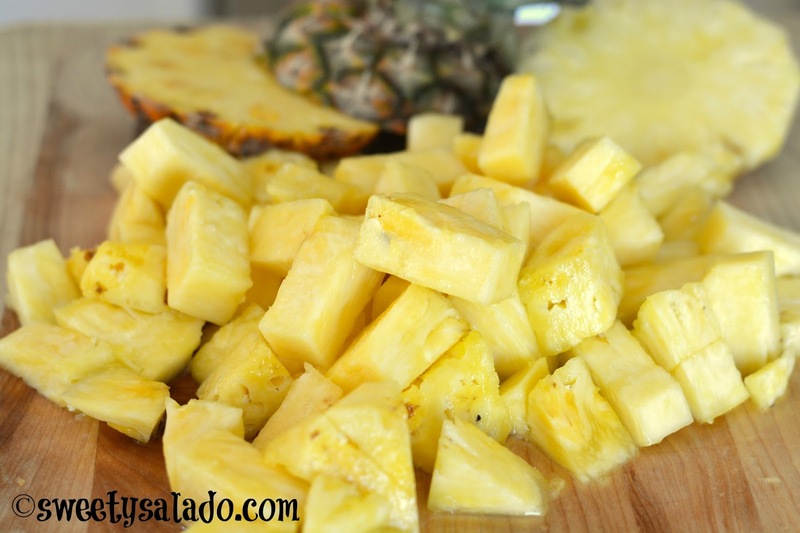 Place the pineapple on its bottom and start cutting off the skin starting from top to bottom. 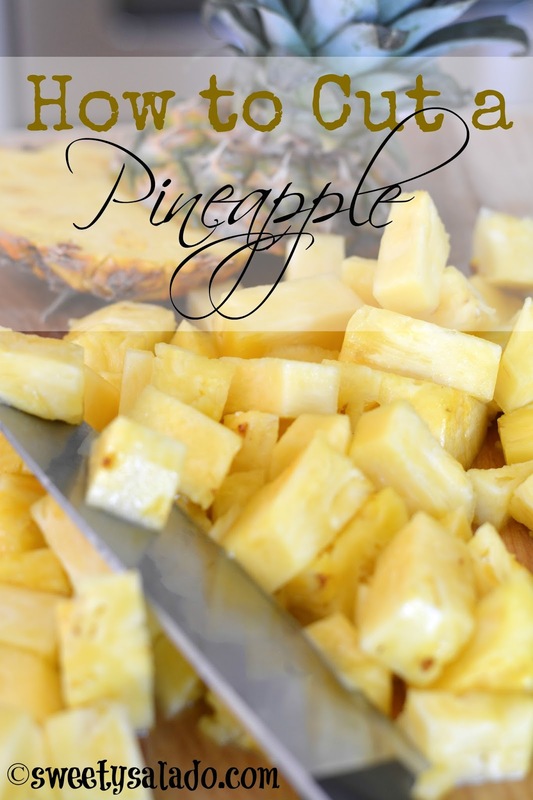 Continue this process using the eyes of the pineapple as your guideline, trying not to cut off too much or otherwise you will take off a good portion of fruit with it. Remove any remaining eyes with the tip of your knife or with a potato peeler. At this point you can cut the pineapple into slices removing the core with a knife or a small cookie cutter. Otherwise, cut it lengthwise into four pieces. Place each piece on its end and remove the core by cutting it from top to bottom. Cut each piece lengthwise and then across to dice it into the desired size.